Our friends hosted their annual Halloween costume party this past week and it was a ton of fun. 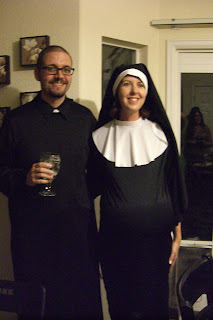 I was a pregnant nun (yes, my belly is stuffed) and hubby was a drunk priest. We took the kids to their first haunted house and they had a blast and so did we! That is too funny and yall look great!